From Bono, Enya and Dana to U2, Boyzone and Westlife, Irish music rarely strays far from its two-syllable range. When it does – think Sinead O’Connor (sorry … Shuhada’ Davit), Shane MacGowan and Bob Geldof – it often courts controversy, blurring the lines between music and politics. After all, favourite son Johnny Logan has four syllables, and Jedward two – so as a theory, it’s all kinds of nothing. 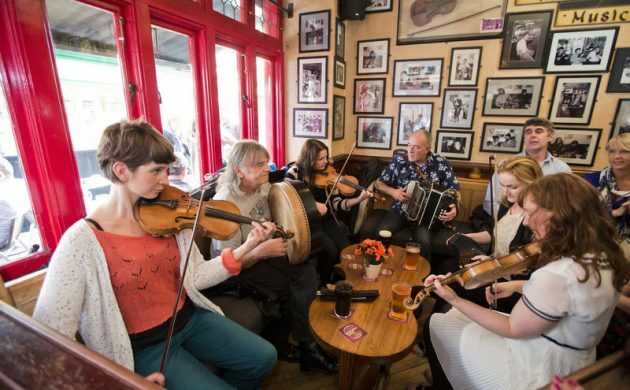 Where there’s no debate is what constitutes traditional Irish music, and below we have done our best to identify the six key instruments to producing that sound. As the popularity of bands like The Dubliners and Dervish suggests, it is a style of music the world never tires of – music that speaks volumes about the culture and values of the country it stems from. As the likes of Danish-Irish musicians LOC (Liam O’Connor) and Lukas Forchhammer will agree, music is in their blood. The bodhrán (pronounced bow-ran) is often referred to as the heartbeat of Irish music. However, despite this rather vital sounding role, the instrument didn’t actually become a major component in Irish music until the 1940s. Before that time the drum certainly existed in Ireland, though without inclusion into popular music. It’s a rather simple drum, described by some as ‘a poor man’s tambourine’. It consists of a wooden frame, usually around 20 inches in diameter, which is covered in stretched goatskin. A tipper, cipin or beater is the name given to the double headed stick that is used by bodhradoirs (bodhrán players) to create its dull-sounding beat. The bones – literally bones but often pieces of wood these days – are used to provide a rhythmic beat similar to the bodhrán. Traditionally, sheep bones were the most popular in Irish music, and though there are different varieties and styles, the Irish tradition is particularly unique. For instance, while North American players typically use two hands, the Irish style uses just one hand. The bones are reputed to be the second-oldest instrument in the world, next to the human voice. Though the bones technique probably got to the US via Irish and other European immigrants and went on to influence the likes of the blues, their history can be traced back to ancient China, Greece and Rome. The fiddle is one of the most integral instruments in the traditional repertoire of Irish music. Although the instrument itself is fundamentally identical to the violin, it is the dissimilar method of playing in that provides the distinction. This said, regional styles can vary as much as the dialects across the country. Where fiddlers from North Donegal are typically ‘aggressive’ in their approach, musicians from East Derry have a style described as ‘ornate’. It was, however, the Sligo tradition that first became popular in America, and it is the style that is most familiar to outsiders. Although not traditionally Irish – having made its way to Ireland via returned emigrants from the US, where it had been developed by African slaves – the four-string tenor banjo is played an octave below that of the fiddle. In Irish music, it is rarely strummed and almost always played using a plectrum or a thimble. Barney McKenna of The Dubliners is often credited with paving the way for the banjo’s popularity. The rise in the tenor banjo’s popularity in Ireland was in part due to the implementation of the Public Dance Hall Act of 1935, which in the long term gave rise to larger dance halls and the céilí. The tenor banjo fitted right in because it could project above the louder musical noise. The harp is the earliest musical instrument mentioned in Irish literature and is one of the official symbols representing Ireland. The nation’s passports, stamps and coins proudly display the instruments, and every bottle of Guinness boasts the harp emblem on its label. Harp music itself was initially favoured by Ireland’s upper classes, and skilled players were accorded great reverence. Yet when the Gaelic aristocracy collapsed, Irish harp music essentially found itself dead. It was not until the 20th century’s revivalist movement that the instrument again found a prominent place in Ireland’s musical scene. Modern versions of the harp are now incorporated into the songs of the folk and dance traditions, with a recent resurgence of interest in the clairseach (tradition harp) being seen. It is said that a piper must spend seven year learning to play the Uilleann pipes, seven years practising, and seven years playing them before they can be considered true masters. A type of Irish bagpipe, the Uilleann pipes (pronounced ill-in or ill-yun, depending upon local dialect) were developed around the beginning of the 18th century, with their modern form arriving in 1890. They descend from the great Irish warpipes or píob mhór , as they were originally called. They are one of the most complicated forms of bagpipe and are almost always played sitting down. Often heard alone, they also play a prominent role in a form of Irish instrumental music called Fonn Mall. Never has so much three-footed fun been had for such a good cause!